Glaro Inc. recently launched a sleek new line of recycling receptacles with an innovative new space-saving design. 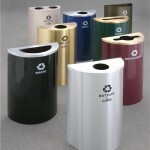 The half round recycling cans, part of their RecyclePro brand can be mounted onto walls or remain floor standing. As with all Glaro products manufactured in Glaro’s USA plant in Hauppauge, NY, the half round cans are durable, well-designed and come in flexible sizes and colors. They are also designed so that they will match other Glaro products seamlessly. More information can be found at recycling receptacles.